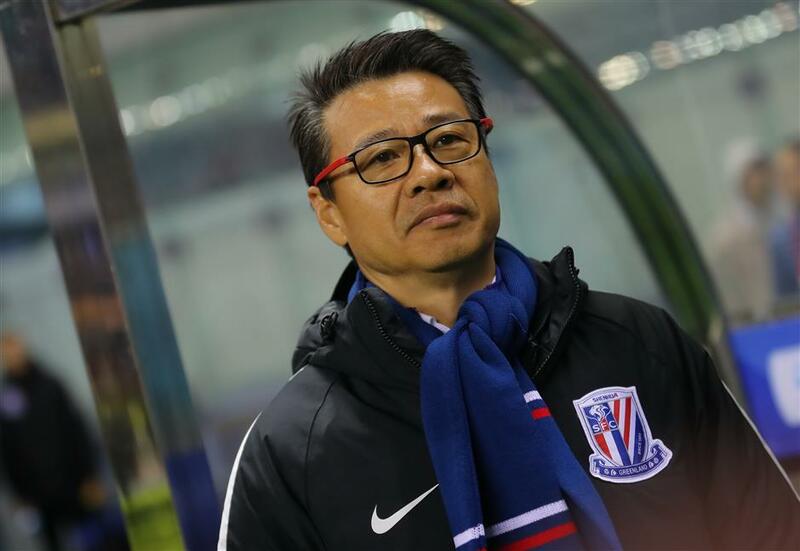 It is hard to estimate how much change Wu Jingui brought to Shenhua in his 76 days as manager, but the Shanghainese man will play a crucial role in its rejuvenation next year. Wu Jingui will continue to manage Shanghai Greenland Shenhua in 2018. Once again Shanghai Greenland Shenhua turned to veteran coach Wu Jingui, and the Shanghai native delivered. The 2017 season would have been a year to forget for Shenhua but for a strong showing in the penultimate games when it defeated city rival Shanghai SIPG in a two-leg Chinese FA Cup finals to lift the trophy — 19 years later. Shenhua last won the CFA Cup in 1998. Few would have bet on the outcome on November 26 given that SIPG beat Shenhua comfortably in the Chinese Super League this season — a 3-1 win at Hongkou Stadium in May when Shenhua was coached by Uruguayan Gus Poyet, and a 6-1 drubbing at Shanghai Stadium in September with Wu just taking over the job. It is difficult to analyze how much change Wu brought to the club in the 76 days since he took over from Poyet — and ending with the CFA Cup trophy — but he is definitely expected to play a crucial role in Shenhua’s road to rejuvenation next season. The 56-year-old was the technical director when he took over from Poyet. Shenhua was 12th in the 16-team CSL standing at that time, just eight points above the relegation zone. It eventually finished 11th in CSL after a crazy year in which it played a runaway nine away matches after its home stadium, Hongkou Football Stadium, caught fire on March 28. Wu first coached Shanghai Shenhua when he took over from veteran coach Xu Genbao in 2002. The following year, he guided Shenhua to its first league title in eight years when it won the Chinese Jia-A League. However, the title was later deprived of due to rigged scandal. He later assisted Shenhua’s foreign coaches, namely Bulgarian Yordan Ivanov Stoikov, Andrzej Strejlau from Poland, Brazilian Muricy Ramalho and Serbian Ljupko Petrovic. The last CSL club Wu managed was Shandong Luneng, when he replaced Dutchman Henk ten Cate in 2012 and ensured Shandong remained in the top-tier of the Chinese league. This was the fourth time that the Shanghai native was roped in to bail out Shenhua — a club he has strong emotional ties with — so much so that he is nicknamed the “firefighter coach” by Shenhua fans. A rejuvenated Shenhua proved to be the better side in both the legs of the CFA Cup against its city rivals. The team did well in defending, especially limiting the striking options of SIPG’s top scorer Hulk. “We knew that Hulk had scored a lot of goals by dribbling the ball with his left foot and charging into the center area. So we worked on it and got defender Bai Jiajun to mark him,” Wu says. “Physically, Bai and Hulk are not of the same level, but Bai is quick in his foot work, and he managed to sink the tank into the mire. Shanghai Shenhua captain, Colombian Giovanni Moreno, celebrates with the trophy after Shenhua wins the 2017 Chinese FA Cup. 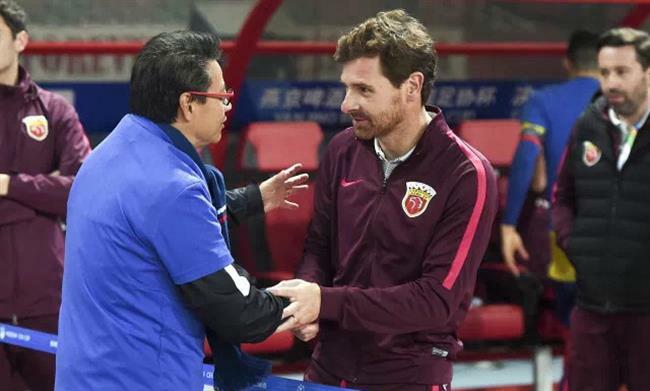 Wu Jingui shakes hands with his SIPG counterpart Andre Villas-Boas during the CFA Cup finals. In the first leg at Hongkou Football Stadium, to ensure there was no away goals for SIPG, Wu gave a lot of defending task to captain Giovanni Moreno who defused SIPG’s freekicks and corners. In the second leg, Moreno was back in the attacking lineup, hunting for away goals for Shenhua. The away goal advantage eventually proved crucial as Shenhua clinched the cup, with the final score 3-3 from two legs. Shenhua had won the first leg 1-0. Wu, the Shenhua savior, was tossed in the air by his triumphant players in front of fans at Shanghai Stadium. He said he spent several hours replying to thousands of congratulatory messages he received after the victory. In follow-up interviews, Wu remained humble, repeatedly expressing his gratefulness to club officials, city government, club’s investors, fans and his players. Wu will probably be one of the only three Chinese coaches in the CSL next season. The other two are Henan Jianye’s Guo Guangqi and Changchun Yatai’s caretaker manager Chen Jingang. Wu said earlier that he had received offers from other CSL clubs in the past two years, but decided to stay with Shenhua. “I’m very familiar with the team. After being given another chance by the club (to become manager), what I focused on was to rebuild the players’ confidence and help them strengthen their technical and mental abilities. We made clear training plans and the players were very cooperative,” he says. The CFA Cup success means Shanghai Shenhua has booked a berth in the 2018 AFC Champions League. Shenhua was eliminated by Brisbane Roar in its one-match qualifier at Hongkou Stadium in February in the 2017 season.